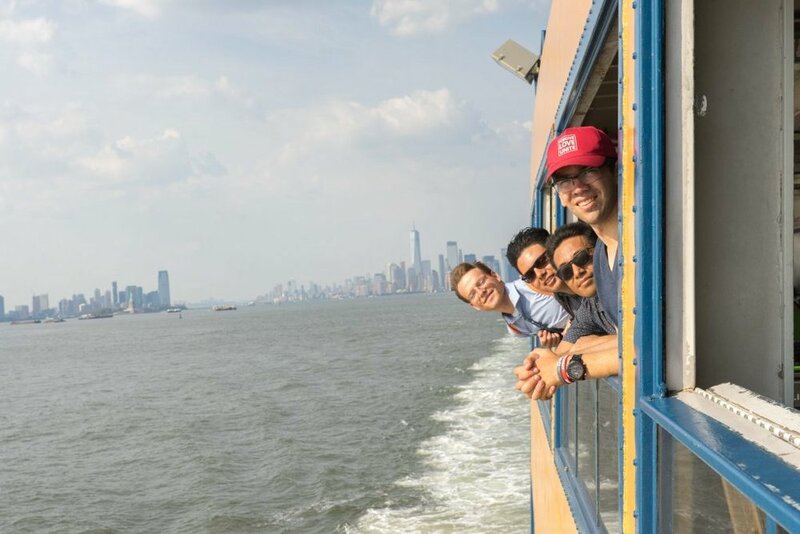 As summer comes to a close, we look back at the inspiring initiative of CARP Las Vegas who created a cross-country leadership training to deepen their friendships, faith, and understanding of God’s providence. CARP Las Vegas in front of the Washington Monument where Father Moon spoke in the 1970s. For 50 days during the summer, CARP Las Vegas brought 19 of their members on a cross country leadership training. From May 28 to July 16, they traveled from California to New York, stopping in various states along the way. The purpose of this trip was to strengthen the participants’ practice in the Principles they’ve been studying and to learn how to share them in real, practical ways. CARP Las Vegas at Unification Theological Seminary where they visited their member Micheal Cordero during Generation Peace Academy’s graduation ceremony. A cross country trip was in the works since January of this year. The core members in LV wanted to give their members a chance to grow from being participants to being leaders and realized only a retreat experience would allow the kind of growth they desired. Their trip had five major components: fundraising, pilgrimage, workshops, community outreach, and mobilization leading up to Mother Moon’s Peace Starts With Me Rally at Madison Square Garden in New York. Fundraising training had two purposes: to fund the trip itself (very practical) and to practice sharing about CARP as a way to deepen their understanding. While fundraising, the members faced rejection but used those experiences to learn through it, realizing the value of the Principle. Their morning singing to bring up the spirit before fundraising. The second part of their trip was a pilgrimage visiting Father and Mother Moon’s (True Parents’) historic landmarks where workshops, seminars, speeches, and different activities inspired the masses with Unification Principles. Through places like the Unification Theological Seminary (the graduate school founded to unite and teach world religions), East Garden in New York (Father and Mother Moon’s main residence in America), and the Washington Monument (where Father Moon spoke to thousands on the national mall), CARP LV was able to experience and appreciate True Parents’ work in the United States. Belvedere, NY, True Parents’ training center in New York where members learned about Unification Principles. After the pilgrimage, CARP LV traveled to Camp KOHOE (Kingdom of Heaven on Earth) in Michigan and hosted an introduction to Unification Principles workshop for young Unificationists and friends from June 16 to June 18. New and returning students of the Principle gathered from nearby states and all could see the transformation of understanding the Principle for the first time. The second workshop CARP hosted was in Dallas, Texas from June 26 to July 3, which focused on Father and Mother Moon’s life. Local Unificationists also participated. This workshop was a great preparation for True Mother’s upcoming rally that would take place in New York in the next few weeks. During the community outreach portion, CARP LV visited different Unificationist communities (like Clifton, NJ, Bowie, MD, and more) and shared their profound outreach experiences in CARP. CARP LV also facilitated discussion forums for the local community. The last leg of their trip took place in New York City from July 9 to July 15th where they “mobilized” people by inviting them to Mother Moon’s “Peace Starts With Me” rally. Through the training up until this point, CARP LV members felt connected to Mother Moon as they shared with others about her dream for peace. New York City and CARP Las Vegas. They also participated in the rally and saw Mother Moon live. Hearing about her for 50 days and then actually getting to meet her was deeply moving for the participants of the trip. “I felt so much pride in [Mother Moon] and the event. Madison Square Garden was really a time where we were coming together as brothers and sisters, and as God’s children, no matter how different we are. It made me really think and appreciate the position that I was in to be a part of this event.” – Marcus Fuller, Jr. They held their graduation completion ceremony for their trip on July 16 at Belvedere Training Center in New York, another special place where True Parents’ legacy continues on. CARP Las Vegas excited and pumped to be moving forward this year! Based on the foundation they laid in the summer, Las Vegas hopes to build on that momentum. Every weekend since, they host Principled Life training workshops to help build on what they have gained. They are also hosting a Pure Love workshop to emphasize the importance of God-centered relationships and abstinence before marriage. They formed trinities (groups of three) to continue to support each other at home and solidify the healthy habits they learned. CARP Las Vegas also plans to do more of these trips in future, and they hope to include more people from other communities across America. This trip is truly inspiring for us in CARP and in America because it is a success story. A successful endeavor by young people to nurture and grow young people to be the standard bearers of hope and leadership in this country, not just in their own community but in other communities as well. As the future gets more uncertain, there will be a need for young people who are not uncertain about where they stand in faith and in leadership. CARP Las Vegas is filling that need.